The rise of American research universities to international preeminence constitutes one of the most important episodes in the history of higher education. 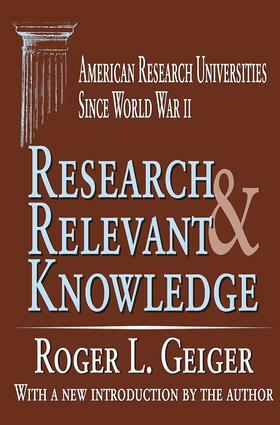 Research and Relevant Knowledge follows Geiger's earlier volume on American research universities from 1900 to 1940. This second work is the first study to trace this momentous development in the post-World War II period. It describes how the federal government first relied on university scientists during the war, and how the resulting relationship set the pattern for the postwar mushrooming of academic research.The first half of the book analyzes the development of the postwar system of academic research, exploring the contributions of foundations, defense agencies, and universities. The second half depicts the rise of the ""golden age"" of academic research in the years after Sputnik (1957) and its eventual dissolution at the end of the 1960s graduate education. When the federal patron soon reduced its largesse, university students took the lead in challenging the putative hegemony of academic research. The loss of consensus quickly brought the malaise of the 1970s--stagnation, frustration, and equivocation about the research role. The final chapter appraises the renaissance of the 1980s, based largely on a rapprochement with the private sector, and ends by evaluating the embattled status of research universities at the beginning of the 1990s.Research and Relevant Knowledge provides the first authoritative analytical account of American research universities during their most fateful half-century. It will be of critical importance to all those concerned with the future of higher education in the United States.